Porcelain is a popular choice for tiles in modern homes due to its superior durability. It also makes a particularly suitable material for shower tiles because of its natural water resistance. Nonetheless, Porcelain tiles – just like any other type of tile – still require routine cleaning and maintenance to stay looking fresh and attractive. 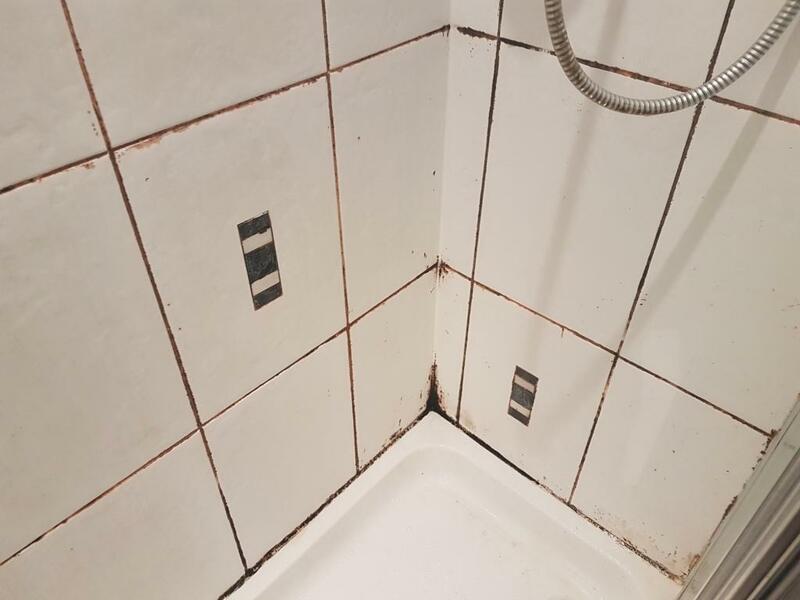 This is especially the case for shower tiles, as they are subject to mould and scum caused by exposure to the dyes in shampoos and soaps etc which as well as staining the tiles can have a dramatic effect on the grout. Below is a photo of a Porcelain shower cubicle I was asked to restore in Edinburgh. The process for restoring these types of tiles is relatively quick and easy, providing you use the right products and methods. Here’s how I did it. To begin refreshing this cubicle, I gave the whole area – paying particular attention to the grout lines – a scrub down using Tile Doctor Duo Clean. Duo Clean is our product of choice for the removal of the common mould and soap scum that builds up on cubicles like this one. Next, I rinsed down the area with fresh water to remove any trace of cleaning product and then left it to dry for a short period of time. 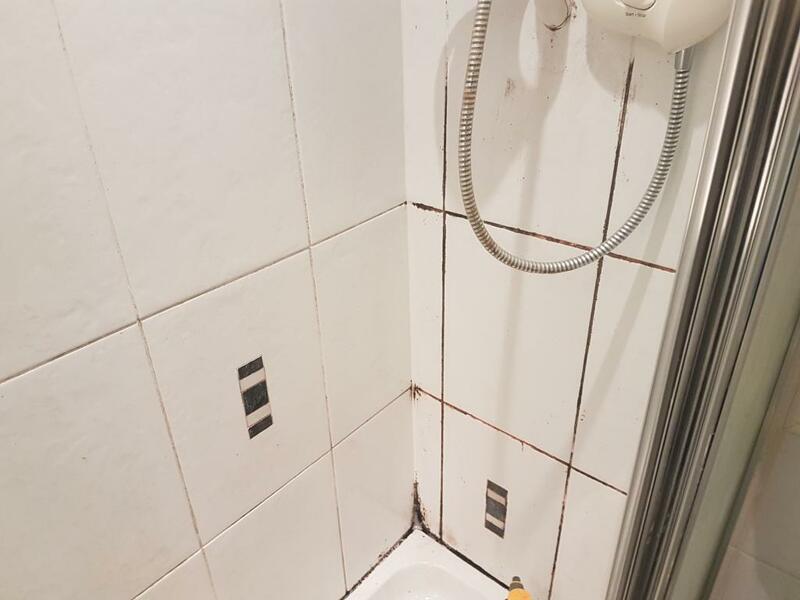 It’s difficult to get the grout lines perfectly clean, especially after years of neglect, but we can resolve the situation by simply recolouring the grout. I this case I felt the grout although cleaner from when I started did need more work so I decided to go ahead and apply a Grout Colourant. 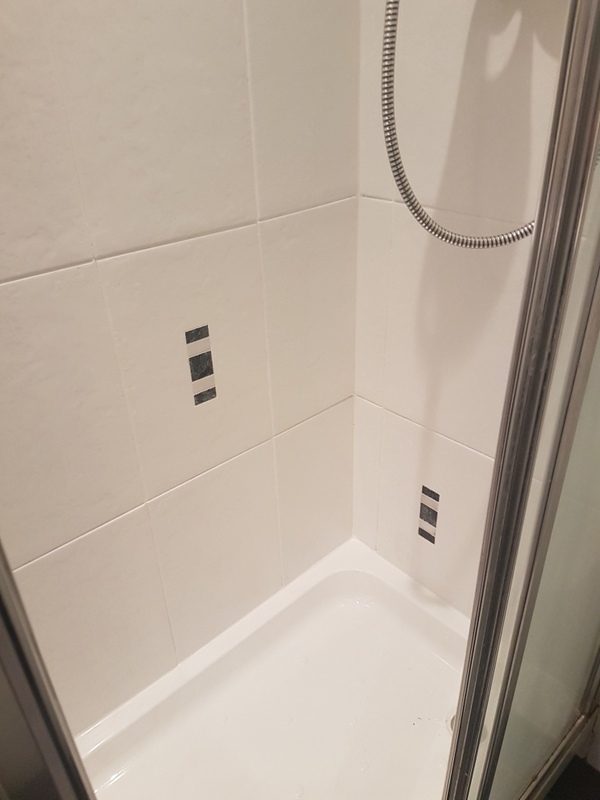 Tile Doctor has a range of Grout Colourants available in ten colours so I painted on three coats of the white colourant which really improved the look of the grout leaving it clean and fresh. Another advantage is the colourant acts as a barrier on top of the grout sealing the grout joint and protecting them from further staining. Other popular colours available in the range include Black, Cappuccino, and three shades of Grey. Finally, I ripped and out and replaced the mouldy silicone around the base of the shower cubicle and replaced it with fresh. The client was very impressed with the speedy restoration. Before leaving the property, I explained that rinsing down the shower cubicle with fresh water after every use can help to reduce the effect of staining and leaving the door and window open after a shower improved ventilation and inhibit the growth of mould. Naturally you can always give me call if the situation gets out of hand. We were delighted with the work which transformed our bathroom and kitchen; indeed they both now look brand new. They came and did the work as planned. Suggested a few changes that were smart, and carried out the work vert neatly. Very satisfied with the job. Arrived bang on time and worked tirelessly all day. The bathroom practically looks brand new. I confess I was slightly sceptical beforehand but I’m really impressed with the results. An absolutely excellent job done by Thomas Wilson. Very professional and lovely to have some clean tiles again. Many thanks. I’ll happily recommend Tile Doctor and Thomas in future. Thomas was really friendly and professional, and did a fantastic job on our flagstone floor. Thank you so much – it looks fab!